We're excited to announce a new addition to the growing library of reports available from Discus: the Motivation Spectrum report. This is an entirely new set of report content focused on helping you to understand and develop a candidate's core motivations. To open a Motivation Spectrum, just select a candidate from your Results List. As long as you have an Enhanced report for a candidate, you'll be able to view, e-mail or print a Motivation report in just the same way as other reports within Discus. For most Discus users, the Motivation Spectrum report is only available for Enhanced profiles. Subscribers to the Discus Premier service, though, will automatically gain access to the new report for all profiles at the Classic level or higher. The report looks at a candidate's unique individual factors that drive their motivation in a work setting, or have the potential to reduce their motivation. The Motivation Spectrum will even investigate a candidate's attitude in their current role, and look at features that may be affecting their motivation in that role. The new report is based entirely on a candidate's existing DISC scores - so long as you have a Discus profile, there's no need for any extra testing. Based on those scores, it will put together an analysis of eight interrelated motivating factors and report in depth on each of these, and the ways they are relevant to any individual candidate. Any of these eight factors can be a strong motivator (or a strong demotivator) depending on the details of an individual personality style. 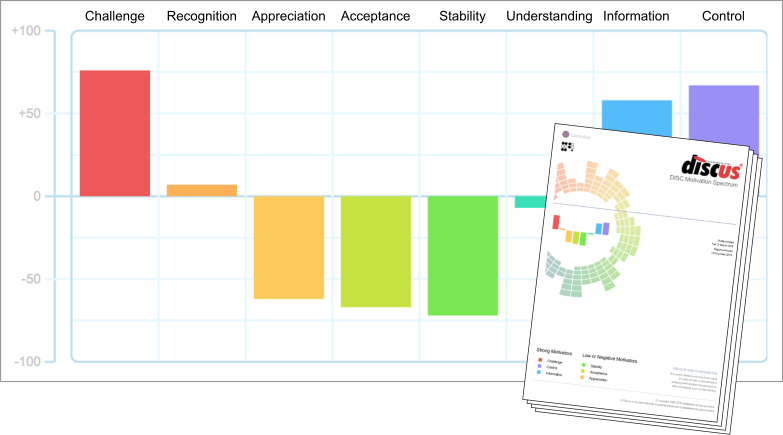 You can see how they apply to your candidates right away - take a look inside a Discus Motivation Spectrum report today!